Remember the way you felt when you gave your first gift? Or the one gift you couldn’t wait to give? That’s why 104.1 Pirate Radio is Stocking the Shelves at Santa’s Shop for CASA! Santa’s Shop empowers children of CASA, children who are in the foster system, to be able to give a gift to a sibling, a teacher, a friend, or a parent. 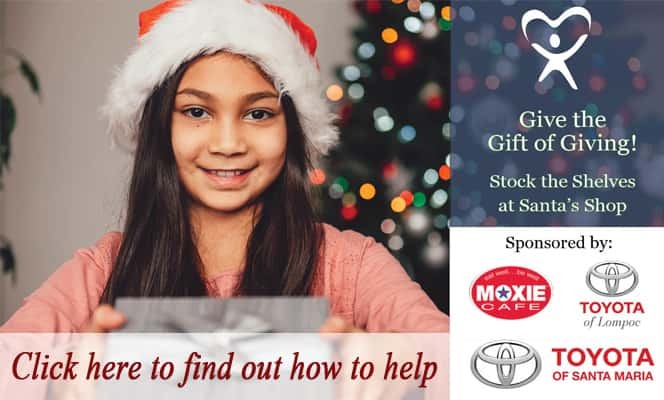 Pick up a gift and drop it off at one of our sponsorship locations – Toyota of Lompoc, Toyota of Santa Maria, Moxie Cafe, or Pirate Studios (2325 Skyway Dr. Ste. J in Santa Maria). Or stop by one of our gift drive locations!